If you would love to get involved in the craze of acrylic pouring art and make your own stunning abstract and colorful art full of cells, then you will need to invest in a few simple supplies. Don’t underestimate how much you are going to get hooked on your new hobby. Seriously, you could probably go all-in and create 20 or more paintings in your first week. Make sure you’ll have plenty of surfaces to practice on. 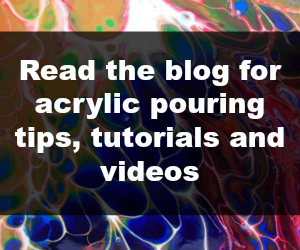 Don't forget the Getting Started With Acrylic Pouring guide which is available to buy from our blog. Don't waste time, paint, surfaces and money. Jump right in with success from your first poured paintings.